Well, you’ve probably noticed that the whole “everything I ever bought, in chronological order” has kind of gone out of the window recently. I would have stuck to it (no really, I would have) but the last two posts would have been about Status Quo and so would the next twenty, with the occasional “Oh I bought this too…” thrown in for good measure to break up the monotony. To say I was obsessed is an understatement. As an example: in a second or third year RE lesson, we were asked to write a piece about our heroes (I have no idea why. I think in an effort to draw a comparison between our own “gods” and the “real” one, in the same way they try and crowbar God/Jesus into a current affairs topic on on Radio 2’s “Pause For Thought” slot). Anyway, my name was called out to read mine to the class, and as I stood up I heard a voice behind me hiss “Here we go, Status Quo…” And they were right; there followed five minutes of me making a case for Francis Rossi being the second best guitarist in the whole world ever, only behind to Jimi Hendrix. Not a position I’d care to try and substantiate now, for since then I have heard this chap: The Boy Looked at Johnny More of him later. That’s what I believe is called a teaser. So,I figure, let’s focus on the occasional “Oh I bought this too…”‘s which are much more interesting. But before I do that, indulge me. 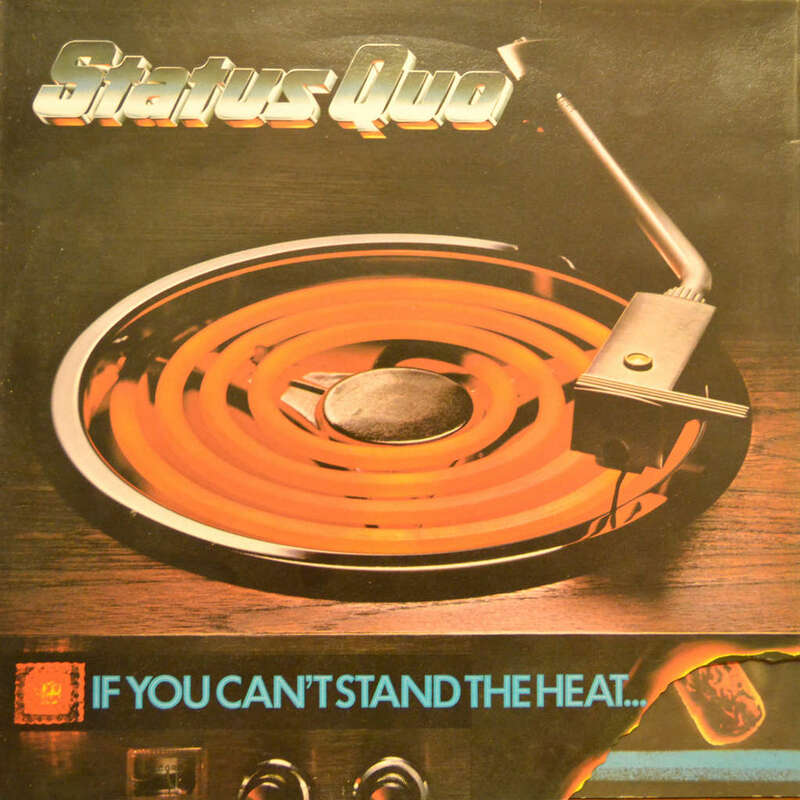 The first Quo album I physically paid for myself was 1978’s “If You Can’t Stand The Heat….” album. Breaking with my tradition of only buying records from supermarkets or newsagent outlets in sleepy commuter belt towns, this I actually bought in an actual record store. Andy’s Records in Peterborough, I am reliably informed, is no longer there, and this makes me a little sad, as does the loss of any independent record store. In those days, Peterborough had a dividing line. There was the pedestrianised area of Bridge Street where all of the main brand conglomerate shops were (Woolworths, M&S, WH Smiths…although I’ve just had a look on Google Maps and found that Woolies is now a TX Maxx…a sign of the times if ever I saw one) and on the other side of the A15 (which I think we used to call Bourges Boulevard, which sounds an incredibly grand name for a road in Peterborough) was a run of dilapidated old shops, including a furniture store on the corner, spread over three levels, which I remember rummaging through once and hearing this being played on the in-store sound system: Hernandez A song gayer than anything you will ever hear, sung by the least convincing Kevin Keegan impersonator you will ever see, and utterly wonderful for it. Sometime in the late 80s, this run of decrepit shops was subject to a compulsory purchase order, and they all disappeared to make way for the least out of town supermarket and car park ever. But Andy’s Records survived, albeit, it seems, temporarily; it moved to the swanky side, onto the pedestrianised bit, where it sprawled over two floors, the basement being a glorious treasure trove of second hand stuff where I picked up some glorious oddities over the next few years. I’m not going to say “More of this later” as I seem to say that quite a lot. With good reason. (Ahem. Adopts best David Attenborough “about-to-flirt-with-gorillas” voice) But it was here, in the darkest corners of Andy Records original location in Peterborough that I spent a good hour or so trying to decide which album from Quo’s incredibly long back catalogue I would buy first. Ultimately I decided upon the aforementioned title, and much as I’d like to say I chose it because it was packed with hits (it wasn’t: “Again and Again” reached No 13, and Accident Prone only managed No 36 (and no, sadly, I haven’t looked that up, both of those facts are stored in the section of my brain marked “Keep Out! Nerd Alert! Quo Chart Positions 1967 – 1982 are in here”)) but actually I picked it because it was the cheapest one there. Need a David Attenborough + gorilla + “the production on that album is amazingl” connection? Now you have it. Ok, so that’s that out of the way. Let’s talk about something better, one of the “Oh, I also Bought This Too”‘s. In 1984 I had no idea who Billy Bragg was, other than that he had written the next 7” single I bought and the subject of the remainder of this post; that he had, apparently, written an extra verse for this single release (see him live these days, and he will sing it and dedicate it to Kirsty. See? : A Verse for Kirsty And by the way, if you clicked that you’ll agree that if you can write a song where you don’t have to sing a word of the chorus and can leave the audience to it, you’re a genius. And, I love the look on the face of the guy singing “But they were only satellites”; it’s priceless. So earnest. Not me, but me 20 years ago); and that he stole the opening line from Paul Simon. Well, if you’re gonna nick it, you may as well nick it from a decent source. 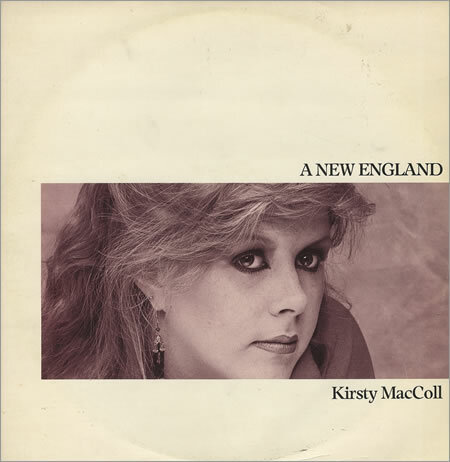 As you, through no fault of your own, are now unable to go see Kirsty MacColl, you should go and see Billy Bragg. I guarantee (though not to the point of a refund) you will have a blast. I took my mate Colin – remember him, from the Beetles-post (still deliberately mis-spelt) – to see him for his 30th birthday, and I have never seen someone leave a gig with a bigger smile on his face. He was already a convert, mind. Billy Bragg wasn’t in Blade, for a start. Or you could throw some money onto this huge steaming pile of dung: If You Can’t Stand The Heat…. I know where the smart money is.